Rei Shimura is a Japanese-American (father's Japanese, but she was raised in the US) living in Tokyo. Why I'm not sure, since she hates her job and is so poor she has to live in one of Tokyo's worst neighborhoods, sharing a crappy apartment the size of a postage stamp. Obviously, she needs a vacation, so for New Year's she travels to the small mountain town of Shiroyama. Unfortunately, while she's there, one of the guests in her hotel dies. The police think it's suicide, but Rei knows there's something suspicious about the death of the salaryman's wife. 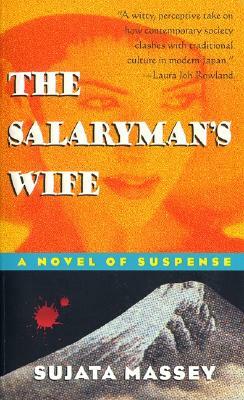 Penny from Penelope's Romance Reviews recommended The Salaryman's Wife to me when I said I love anything having to do with Japan in my review of Ink. I'm so glad she did! I loved Sujata Massey's voice and the setting was fantastic. Rei was also a very sympathetic, intriguing character, even though her determination to live in Japan never made total sense to me. If it's because she likes Japanese antiques, that doesn't seem like a strong enough reason to work at job you hate and live in penury. I can understand her deciding to take a chance and move to Tokyo without a job lined up, but most people who do something risky like that give themselves a time limit to make things work, which Rei apparently didn't. I had some other minor quibbles with the book: who the murderer was and the motive was pretty obvious, and other plot twists and clues practically had a notation next them in the text saying, "This will play a role later in the novel!" But none of that bothered me too much because The Salaryman's Wife tells a great story. It's not so much a mystery as a book about a young woman finding her place in the world. When The Salaryman's Wife starts, Rei is very sensitive about her mixed heritage and the fact that she's a foreigner who doesn't fit in. She doesn't know what she wants to do, just that she's not doing it. What she does know is she wants to stay in Japan. By the end of the book she's confident, knows what she wants, and is pursuing her dreams. And the way in which this happens is incredibly implausible and 100% delightful. I also liked Massey's writing style. She doesn't spell everything out and lets the reader do some work to discover what's going on sometimes. The personalities and motivations of the secondary characters are slowly revealed over the course of the book, too, and the story never dragged or seemed boring. Plus, romance! There's a romantic subplot with Rei and a Scottish lawyer named Hugh. While I did like the romance (of course), I'm still not too sure about Hugh. He can be pretty insensitive sometimes, and what was with the coterie of women that kept treating him like a gigolo? I'm a little worried he won't be there for the long haul, which would be upsetting since I am sort of attached to him, despite my reservations. But he's coming back in the next book, which makes me happy since I'll definitely be reading it! This is a great mystery I'd recommend, especially if you're a fan of Elizabeth Peters.